The Premier Division’s bottom club picked up three points away to Finn Harps at Ballybofey. 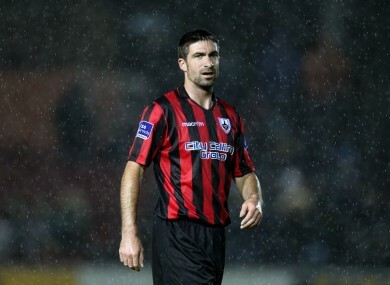 Longford's Kevin O'Connor (file photo). LONGFORD TOWN TOOK their first League win since March as Kevin O’Connor’s first half goal secured a win over Finn Harps in Ballybofey. O’Connor’s goal and an 81st-minute penalty save by Ryan Coulter were the key moments as Longford won for the first time since the season’s opening night. Coulter beat away a tame Ruairi Keating spot-kick as Harps were handed a golden chance to draw level after Dave Scully was fouled. Longford took the lead on 17 minutes when O’Connor let fly from 25 yards, looping a fine attempt over the head of goalkeeper Richard Brush after Packie Mailey’s headed clearance fell invitingly. Brush, who replaced Ciaran Gallagher despite his excellent display against Dundalk on Monday, prevented Don Cowan and Peter McGlynn from doubling the visitors’ lead. Late in the opening half, Eddie Dsane, after surging clear, rolled past the advancing Brush, but wide of the far post. Harps, searching for a first win – and goal – in seven outings, saw Ciaran Coll denied by Ryan Coulter, while Thomas McMonagle shot at the Longford goalkeeper from point-blank range in the opening minute. Ollie Horgan, the Harps manager, showed four changes to his team from the side that lost 2-0 to Dundalk at Oriel Park on Monday with recalls for Sean Houston, Adam Hanlon and Ethan Boyle, as well as ‘keeper Brush. Harps were inches from an equaliser on 72 minutes but Keating, a second-half substitute, blasted off the crossbar after doing well to get free inside the area. Nine minutes from the end, Keating was thwarted by Coulter and despite Harps laying siege, they couldn’t find a way through and it’s now seven games without a win or a goal for the Donegalmen. FINN HARPS: Richard Brush; Keith Cowan, Packie Mailey (Dave Scully 52), Thomas McMonagle; Ciaran Coll; Josh Mailey, Ethan Boyle (Kevin McHugh 82), Adam Hanlon, Sean Houston, Gareth Harkin, Ciaran Coll; Ryan Curran (Ruairi Keating 65). LONGFORD TOWN: Ryan Coulter; Jamie Mulhall, Pat Flynn, Yann Mvita, Conor Powell; Don Cowan (Rhys Gorman 90), Philip Gannon, Kevin O’Connor, Kealan Dillon, Peter McGlynn (David O’Sullivan 78); Eddie Dsane. Email “Longford claim a rare victory in relegation six-pointer thanks to O'Connor's match-winner”. Feedback on “Longford claim a rare victory in relegation six-pointer thanks to O'Connor's match-winner”.